A portable display provides a simple graphic backdrop that can be used in a variety of settings and spaces. A portable stand should be simple to set-up, easy to transport and provide a professional backdrop. Whether this a roller banner or pop-up stand, fabric stand or modular display it must support and enhance your exhibition presence. There are many choices and options in the portable display arena and of course these systems vary significantly in terms of finish, quality and price. We have selected a limited range of products that we have tested and used that we are confident that whether you are looking at an entry level roller banner or a modular exhibition stand these systems are some of the best in today’s marketplace. 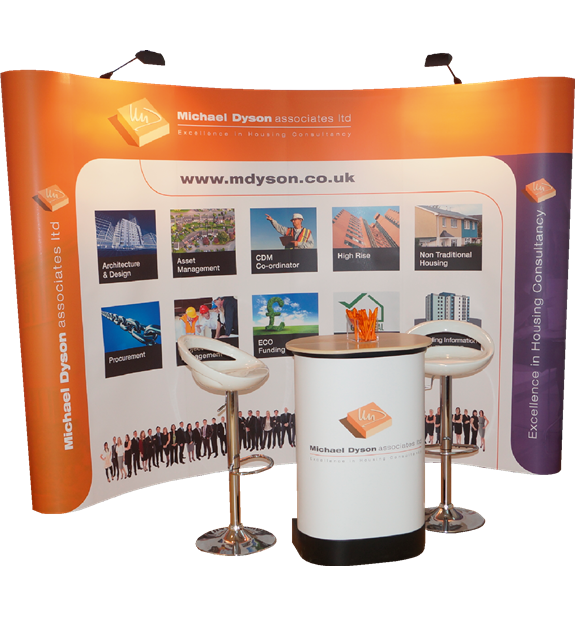 Combining high quality portable exhibition systems with our own on-house print facility we can ensure that your new exhibition stand will look professional and last a long time, maximising your return on investment.